Hello Friends – Tina here, back with another “Passport Pals” project! I love it when Frenchie and I guest post on each other’s blog every two weeks – it’s so much fun! 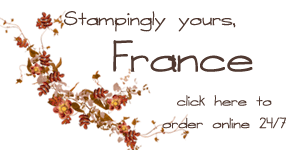 Because we can only sell Stampin’ Up! products within our own countries, this has been a great way for Frenchie and I to work together and provide you with the best customer service, no matter which side of the border you live on! If our “Passport Pals” service is new to you, just click HERE for all the details. Frenchie and I are both sharing Saint Patrick’s Day themed projects today, and I love what Frenchie created! You can see her card by going to today’s post on my blog, The Serene Stamper . Today’s project is a fun home décor piece that I created using My Digital Studio (MDS). I simply purchased and downloaded the “Lucky Frameable Designer Template” (#129930) and printed two copies onto Very Vanilla Card Stock. I trimmed the first printout to fit into my frame and kept the glass out. For the second printed image I cut out the letters that spell “KISS ME” and covered the letters with versamark ink and heat and stick powder. I zapped the letters with my heat tool, which activates the Heat and Stick powder into a type of glue…. …and sprinkled Dazzling Diamonds Glitter over top. I did another quick zap with the heat tool to make sure the Dazzling Diamonds were properly adhered to the Heat and Stick Powder. So SPARKLY and PRETTY! I also used my Garden Green Marker to colour the top of each letter and added a little heart for some fun, using a piece of silver glimmer paper which I coloured with my Garden Green Marker. A few stampin’ dimensionals on the back of the letters were used to adhere them to the framed image and some rhinestones (colored with a green sharpie) added a little more bling! I also made a four leaf clover to add a little dimension to the whole piece. To do this I ran a piece of Old Olive Card Stock through my Big Shot using the Square Lattice Embossing Folder. Then I cut out my hearts with the “Hearts Collection Framelits” and folded each one in half. Then I took some wire and placed in the bottom tip of the heart, in the folded centre, and use a dab of hot glue to hold into place. Fold open the hearts and voila! A four leaf clover! A bit of burlap trim finished it off! The MDS frameable art digital downloads are so much fun and make super fast décor and gifts. You can get lots of ideas of how to use these digital downloads and more by going to www.mydigitalstudio.net. Don’t forget to head on over to my blog to see Frenchie’s cute card for Saint Patrick’s Day!